I sure held you in suspense with this post about what we were for halloween this year, didn’t I? Well now that everyone’s moved on and no one cares about Halloween anymore, I present to you…Halloween 2013. Let me give you some background. First of all, I’m not kidding when I say our costumes are last minute (and I know it shows). We usually plan our costumes around stuff we already have or things that would cost us hardly anything. This year I thought we should finally put to use the outfit that I brought my unborn child at the time when we were taking our baby moon in San Francisco. We found a samurai/ninja outfit in China town and bought it thinking it would be hilarious if I dressed our kid in it to go to the store on regular non-halloween days so people could think to themselves, “Aw look at that cute ethnic child with his ethnic mom.” Unfortunately the outfit was at least ten sizes too big for our newborn and then we kinda forgot about it. Until this year. 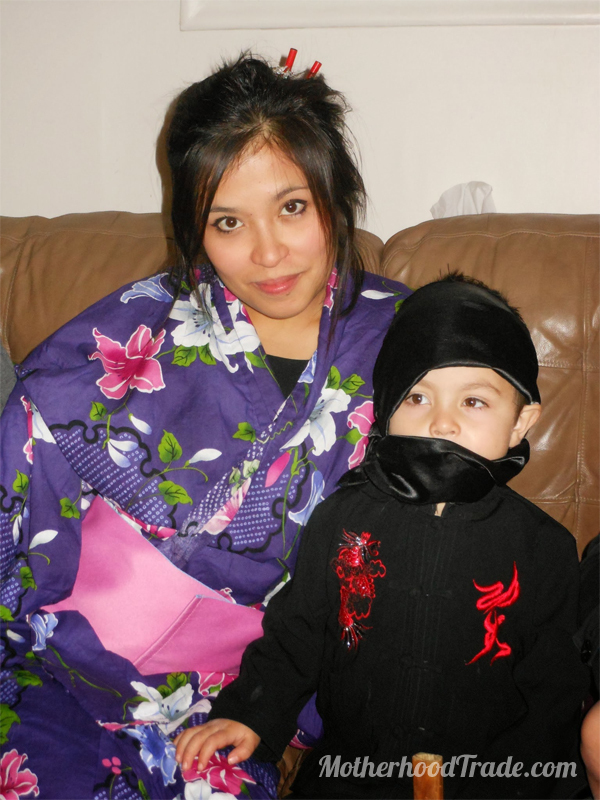 This was the year to finally use it, so we based all our costumes around this ninja costume. I had an awesome Kimono my aunt gave me as a gift several years ago that I decided would work. 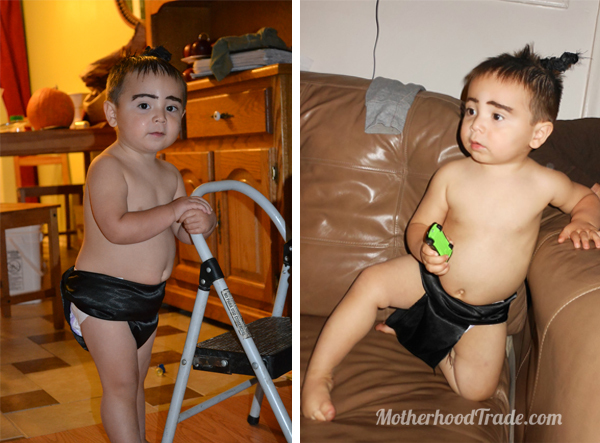 And of course the baby was the simplest costume that would work with his features and body type: a SUMO. So, do you see the whole Asian trend? Well my husband is not Asian. Coming up with what would work for him was the trickiest. We thought, “Well, you could be the British imperialist that conquered parts of Asia.” “Naw that ‘s way too racist,” we agreed. Well, Halloween came and we couldn’t think of anything better so we did it anyway. Sorry for the raciness. It is just a joke that fits our family, ok? Think about it: I’m half Chinese and my kids are a quarter Chinese. Add it all together and my husband essentially has one full Asian as his family…and he has essentially conquered our hearts… thats how I justified it at least. Leg Wear: Long Johns over socks. Sheer genius, right? I suppose that maybe a reason I married him. 2. 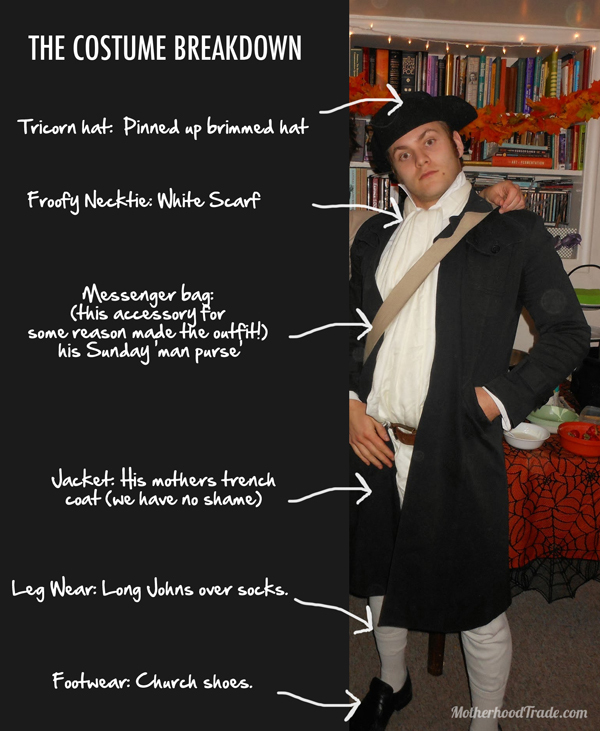 Find lots of reference pictures (online) of what you are trying to create as your costume. 3. Think to yourself, “What do I already have that could work as _______” Or what would be the best way to make this. Google any idea…there is a good chance some else has thought of it already. 4. Search your brain and open up any possibility until you find the right option. So there you have it. 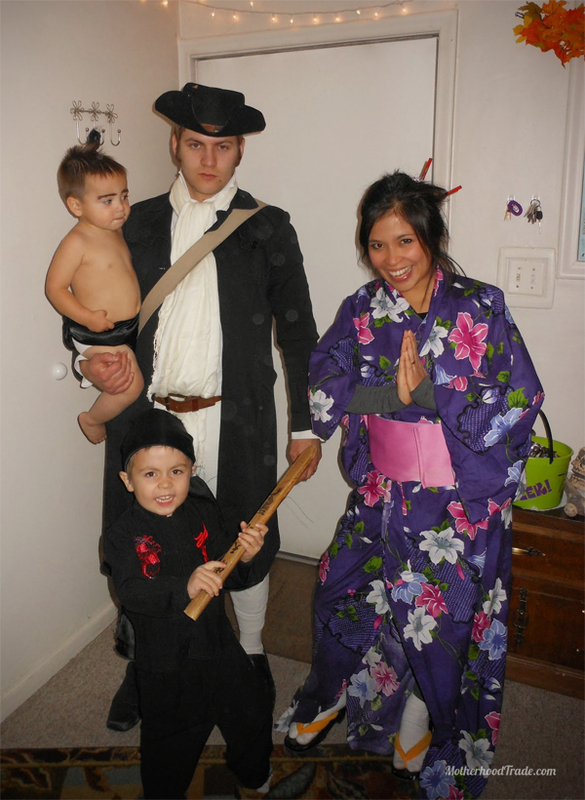 Our family Halloween Costumes 2013. Asians and the British Imperlists that conquered us. heh. Thank you to my sister-in-law Natalie for the photos she took of us!